J.J. Hanson doesn’t necessarily believe in luck or miracles, though he is grateful to be alive. The 35-year-old Glen Spey man has bounced back from what many fear most—a cancer death sentence. In his case, he was given four months to live. J.J. Hanson holds a sign with the words that became his motto during his battle against an aggressive brain cancer. Photo provided. Hanson, the former Ulster County budget director, was diagnosed in May 2014 with glioblastoma multiforme, an aggressive and deadly form of brain cancer often dubbed the “terminator. People diagnosed with the fast-growing tumors typically live less than two years, even after surgery, radiation and chemotherapy, according to sciencedaily.com. For Hanson, it had been a fairy-tale life up to that point. He was a former football star, U.S. Marine and happily married man and new father. Hanson had a solid background in public policy, having worked under governors Elliot Spitzer and David Paterson. He moved on from there to become an aide to Ulster County Executive Michael Hein, a position he left in October 2013 for a job as the operations manager at Avesta Communities, a start-up company in Tampa, Fla.
Hanson was on the job when his world changed suddenly. “It felt like an intense anxiety attack. It didn’t go away. I started to lose some of my cognitive abilities. I said, ‘I need to call 911.’ That’s the last thing I remember. I had a grand mal seizure and woke up in an ambulance,” he said. From there, doctors did a number of tests, and at the prodding of his wife, Kristen, an MRI. Doctors found two lesions in his left temporal lobe, and a biopsy later confirmed that he had brain cancer. Hanson was told it was inoperable. He was determined to get additional opinions and eventually found a surgeon at Memorial Sloan Kettering Cancer Center who agreed to operate. The doctor removed two tumors and the majority of a third. But there were major setbacks. Hanson suffered swelling of the brain and had nine seizures, which resulted in a loss of his cognitive abilities. During this time, Kristen became his primary caregiver, while also looking after their 1-year-old son, James. “Obviously, it was a shock when J.J. was diagnosed,” she said. “One day, I had a perfectly happy, healthy husband, and the next day you get a phone call that the worse possible situation has happened—a terminal diagnosis. “It was crazy and hectic and chaotic, but we were so fortunate to have such a loving, caring, supportive network of friends, family and community, and I don’t know how we would have gotten through without them. 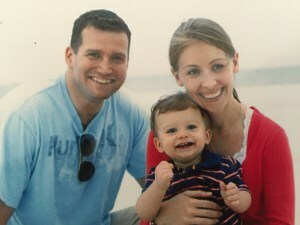 Kristen said she tried to learn as much about her husband’s disease as she could and focus every day on making their son’s life as normal as possible. A door then opened for Hanson to take part in a clinical study with a drug called MK 1775. He credits that, along with changing his lifestyle, for accelerating his recovery. Hanson, who had since moved back to Sullivan County, also began researching the issue of physician-assisted suicide, particularly after he learned about Brittany Maynard, a California woman who had the same disease he had. She ended up moving to Oregon, where physician-assisted suicide is legal, and became a volunteer advocate for Compassion and Choices, an end-of-life organization. Maynard, 29, chose to end her life in November 2014 by taking the lethal drugs prescribed by her physician. Hanson followed her story with interest and became convinced there was another way. He ultimately connected with and became president of Patients’ Rights Action Fund, a Princeton, N.J.-based organization. “Two years ago, if you would asked me if this was an issue I would have been advocating for, I would have said, ‘No,’ but going through what I went through, I understand it from a differ perspective, and that perspective is how it affects other patients,” Hanson said. “The reality is—the way the law is written and presented is far different. This could have a pretty significant, negative consequence on patients, the elderly, on people who are in a disadvantaged position within our society. Doctor-assisted suicide is legal in five states—Oregon, California, Washington, Montana and Vermont. On May 23, New York inched closer as the state Assembly Health Committee passed the Medical Aid in Dying Act sponsored by Assemblywoman Amy Paulin, D-Scarsdale, and Sen. Diane Savino, D-Staten Island. The measure would legalize doctors in New York to prescribe end-of-life drugs to the dying. While it has a way to go before it reaches the floor for a vote, David Leven, executive director of End of Life Choices New York , said lawmakers are on the right track. “The fact is life is precious and very few people at the end of their lives want to die, but if they are dying, they should decide—not J.J. Hanson, not the Catholic church or any other religious group, not the government and not some in the disabilities rights community,” he said. “This is about patients who have been determined to be terminally ill by two different doctors and by a process that takes weeks and by people who have decision-making capacity. If there’s a question by either doctor, they have to be referred for counseling,” Leven said of the bill. The most recent Gallup poll on the issue seems to back up Leven’s general view. The poll, conducted one year ago, found that 56 percent of Americans believe doctors should be able to help the terminally ill end their lives. Hanson, however, stands firm and said it will demoralize the terminally ill and even change general views about suicide. Doctors, he added, make mistakes and misdiagnose. “There was a time in the fifth month that I questioned whether I should continue to fight. At that point in time, you’re not in your right frame of mind to be making that decision. You need support,” he said. “Many people ask me, ‘How do we fix this’? You can’t fix it through assisted suicide. If the problem is people going through difficulty at the end of their life, let’s increase palliative care. Let’s work on end-of-life planning. Let’s work on helping those who are going through end of life in a very positive and valuable way.